Finally something mom and I agree on. I got my mom a SpiceBreeze subscription for Christmas and we had a great time cooking the first dish together while I was visiting for the holidays. Neither of us had ever heard of it but it was simple and really delicious. She loves travel and food so this was the perfect gift for her. Super affordable too. I'm excited to see what she gets next month! I was so excited when my spices came, but things kept getting in the way of me making the recipes until about two weeks later - the spices were still fresh and waiting for me! I tried the meal kits like Hello Fresh, but the ingredients would go bad before I could get to them - not with SpiceBreeze! 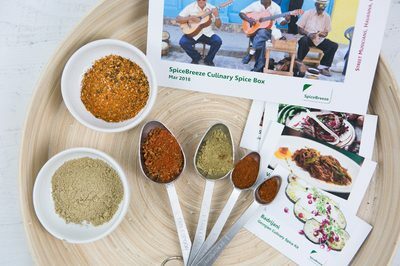 SpiceBreeze was just being carried around in my purse until I could shop for the ingredients and cook up the meals - easy! My first one was South Africa's Bobotie and so delicious. I love that there are substitutions written for little things to add or to substitute for different ideas and tastes. The spices smelled so good too! This is definitely my favorite subscription box I've ever had, and the price is not going to break the bank, either! I am excited for my next box! I have tried meal prep-type services before, and this one is perfect for me. I get to try new, delicious spices and recipes, and every one I've received has been so tasty. The recipes are easy to follow, and I love that they include substitution recommendations. It's priced right, and the customer service is excellent. I can't wait to try more recipes!